The coats are identified by their feel rather than their look. The wool coat is one that I love because I live with severe allergies and asthma. 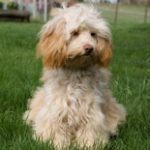 This coat is most like a poodle coat and although the wool coats of our dogs are very soft they feel like poodle coats and are very curly. These coats absolutely do not shed. Even during the change from puppy coat to adult coat they shed very little. Our Aussi has a curly wool coat. He is clipped so that he can lead his very active life style. Lilyanna has an unusually soft curly wool coat that waves when it is long. The fleece coat is wavy rather than tightly curled. It is a very desirable coat because it is slightly easier to look after than the wool coat and it has a lovely silken feel. 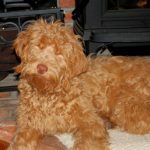 Although we have not had a shedding fleece dog there is the possibility of some light shedding when they change from a puppy to adult coat. The fleece coat does need to be brushed but it is much more easily kept long than a wool coat. The puppy and adult dog will need regular grooming because the face will need trimming as will the bum and beneath the ears to prevent matting. Somewhere between nine and fourteen months of age the adult coat will grow in. As if by magic the coat will begin to tangle and mat next to the dog’s skin. At this transition time the coat will need lots of attention in order to keep the length. Brush right to the skin with a stiff brush or rake. If the dog mats at this point she will have to clipped short by your groomer. The hair coat feels very similar to the hair on your head. It is unlike the feel of wool or fleece. The hair coat will shed. It requires little attention. 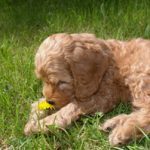 Puppies will often look like they are going to have a fleece coat until the hair comes through the puppy coat at about eight or nine weeks of age. 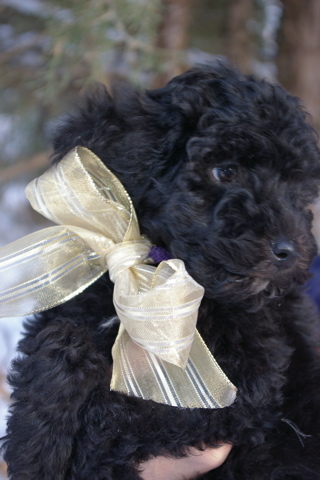 We will always know if we are going to have a hair coated puppy because we don’t allow them to leave home until between ten and eleven weeks. 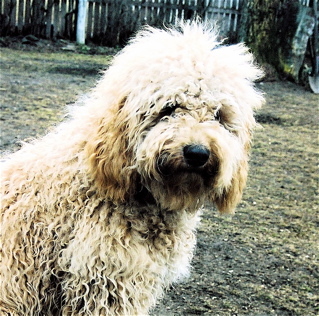 The doodle with a hair coat has the same wonderful temperament and personality as the doodle with the non shedding coat but is not good for a person with allergies or for a family that has chosen the doodle because of his non-shedding qualities. When Lilyanna’s wool coat is long it needs regular brushing. It is hard to get a brush through the curls if you leave it too long. (trust me I know this). Without this regular brushing right down to the skin mats will form next to the skin. Mats make it very uncomfortable for the dog to walk and run and play. 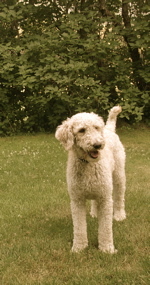 We keep our wool coated dogs clipped short because we live with fields of weeds and burrs. 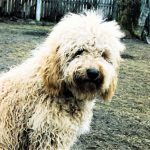 It is quite possible to keep a wool coated dog with a long coat, it simply is a matter of keeping up with the brushing and keeping feet, faces and bums clipped. This would be a trip to the groomer at least every second month. Every six weeks keeps dogs in both long and short coats looking and feeling like movie stars. 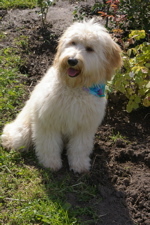 No matter what the doodle coat there is grooming required. 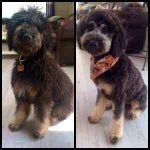 This can either be done by an interested family member or your groomer. 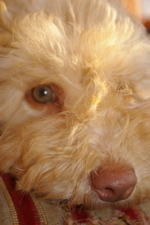 When a puppy’s coat changes to an adult coat there can be some light shedding for a short while. 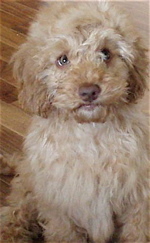 Fur grows out of the ears of a labradoodle. It begins its journey deep in the ear canal. 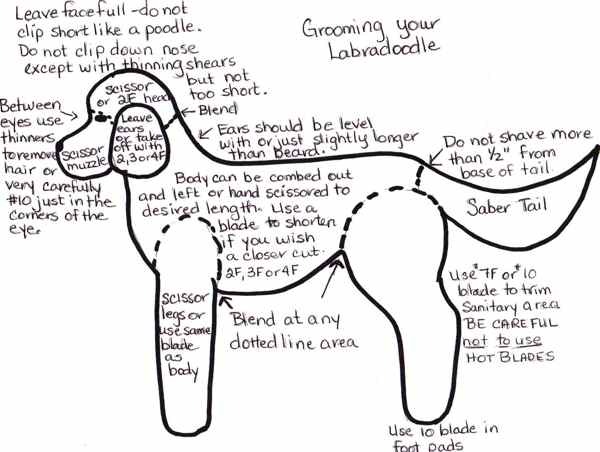 Groomers always used to pluck the hair from the dog’s ears but now the thinking is to simply keep ears clean. If ears are not keep clean and dry dirt and wax can lead to severe ear infections. You can tell when the doggie has hot ears that there is a problem and a trip to the vet will be in order. Some doodles love to dig and have very thick fur in their ears. This means it could be a good idea to pluck the fur from deep in the ear.It is not difficult to take tweezers or better still a hemostat and pluck out the fur on a regular basis. I must say I almost swooned the first time I did it myself but it does get easier. Unless you are an expert it is a two person job, one to hold the dog and promise treats, the other to pluck. Your vet can recommend an ear drying powder which will keep the ears in good health. Of course, your groomer will do the ear plucking for you. If you take your dog every six weeks she should be fine. Unless dogs travel on a stone river bed a couple of kilometers every single day they need their nails trimmed. 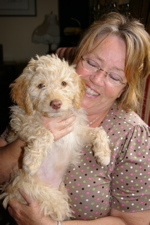 Our Labradoodles have dew claws and they will always need attention. Nail trimming should be done every few weeks. 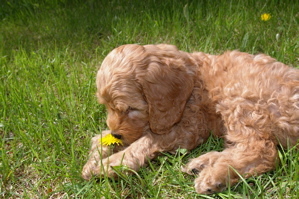 It isn’t difficult to do it yourself with a special clipper you can buy at any pet shop. 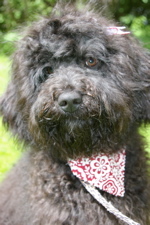 It is however another wonderful thing your professional groomer will do. 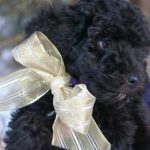 Ours paints our standard poodle Annabel’s nails a different colour every time. Our doodle girls have fuzzy feet and so have to be content with a simple nail trim. 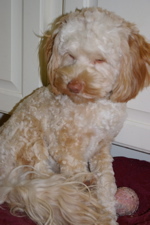 All long coated dogs need a trim around their little bottoms for ease of toilette. Bernie was photographed before grooming on the left and after grooming on the right. He is enjoying his new summer doo as he loves water sports. 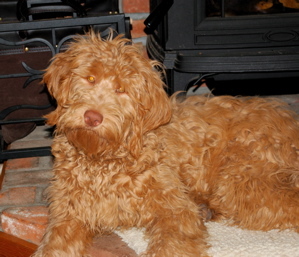 This medium puppy’s mum has a wool coat but he is developing a fleece coat because of his dad. This boy always stops to smell the roses or dandelions.